Earlier this month, we told you about a spear phishing campaign specifically targeting banking customers in Czech Republic, and now a similar scam is targeting bank customers in Finland. Finnish banks warn their customers of phishing scheme. 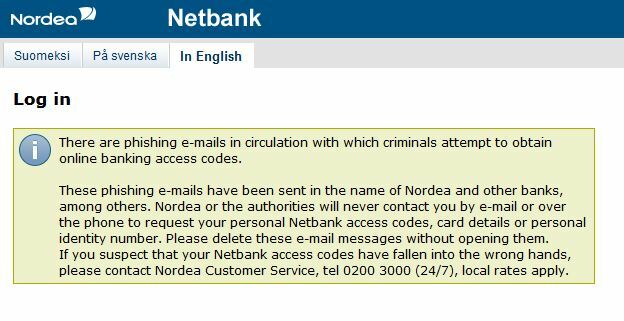 This weekend, Aktia, Nordea, and Nooa Säästöpankki customers received text messages and emails informing them that their online banking services were being discontinued because of a payment in default. The message said the payment had to be made immediately to avoid this. The victims were then instructed to follow a link in the email where they could enter their ID and bank access codes including PIN. The victim was promised that a representative of online banking services would call to confirm after the payment was received. So far, 500,000 euros has been stolen. Of course, there is no default payment and the whole thing is a hoax to earn cybercriminals money. Within the last month, 95 percent of the victims have been women, said Detective Superintendent Jukkapekka Risu from Helsinki Police to the Helsinki Times. Do not click on links, download files, or open attachments in emails from unknown senders. Phishing websites often copy legitimate websites so they appear authentic. To be safe, call the bank to find out if they really sent that email to you. Do not call the number in the email. It can easily be faked. Look up the real number of your bank and call using that. Banks will not ask for customer names or IDs by email, text message, or phone. If you have fallen victim to the scam message and have volunteered information, please contact your bank immediately. Protect your computer with a firewall, spam filters, antivirus and anti-spyware software. Both avast! Internet Security and avast! Premier have these important features. SafeZone is an additional security feature in avast! Pro Antivirus, avast! Internet Security and avast! Premier, which allows you to browse the web in a private, secure environment, invisible to the rest of your system. For example, if you do your banking online, you can be sure that your personal data cannot be monitored by spyware or key-logging software.